Apologies that this post is so delayed. I’ve been without wifi for a little bit. Enjoy! 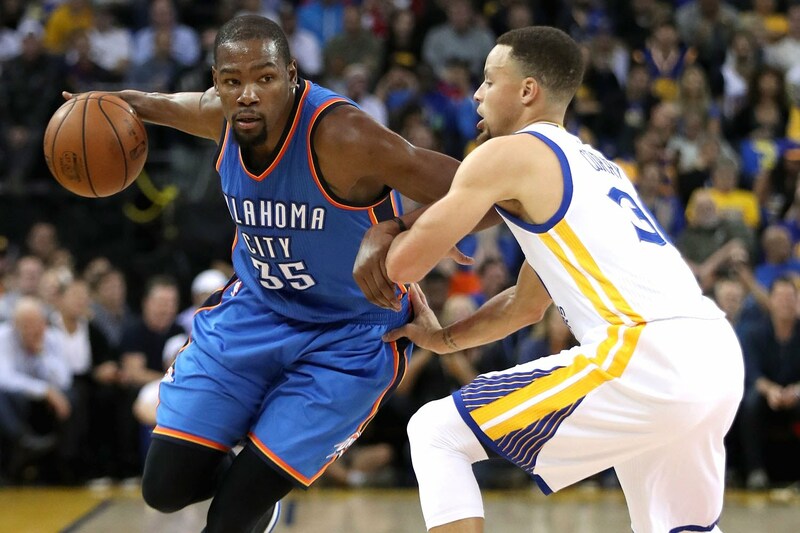 Kevin Durant: beloved while abhorred, unassuming while prominent, cranky while caring, loyal while fickle. 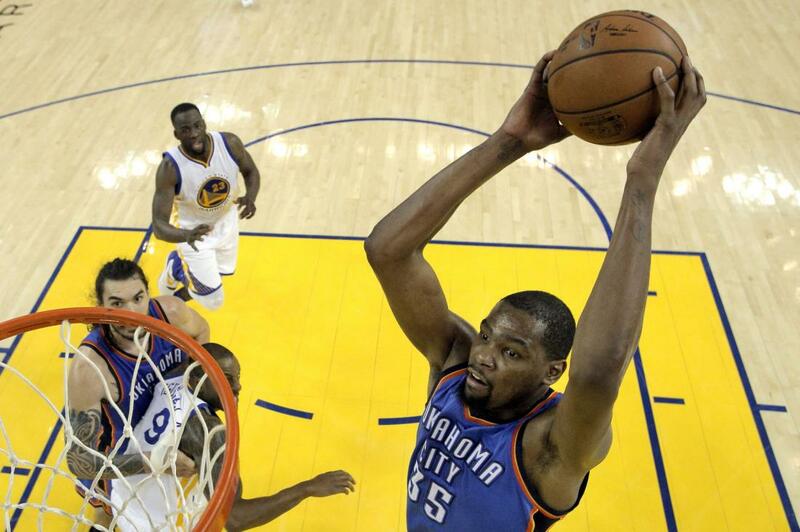 Kevin Durant is a lot of things, and he always has been. But there’s been one constant, one-way to define him for as long as he’s been one of the NBA’s superstars: Oklahoma City. OKC was KD. KD was OKC. Today, the word “bombing” isn’t the first thing that comes to mind when you hear “Oklahoma City”. But, the words “Oklahoma City” don’t exactly fit either “Kevin Durant” anymore either. Kevin Durant—I cannot believe I am saying this—is a Warrior. A freaking Warrior. And that defies any definition. 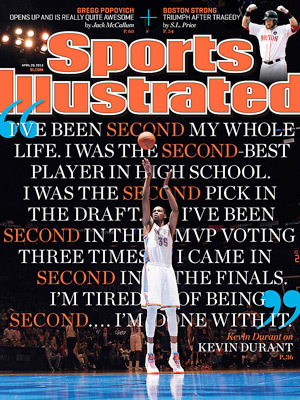 Maybe Durant’s decision is the most authentic view of the man himself yet: full of complexities, murky. 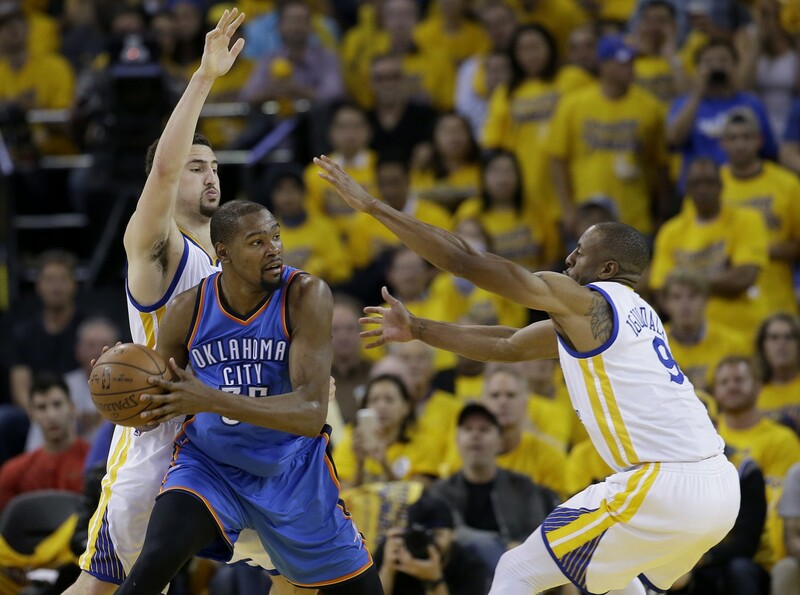 On the one hand, Durant should have trotted it back in Oklahoma City at least one more time. That way, he and Russell Westbrook could leave (if that’s what they wanted to do) together next offseason if things hadn’t gone well. But things would have gone well! Finally, after all these years, the Thunder seemed to figure something out against the Spurs in the second round of these playoffs. KD and Russ finally were able to play together without competing for the ball. Steven Adams bloomed into the league’s best center. Sure, the collapse against Golden State was crushing, but they were so close. They would surely have been title favorites entering the season. But on the other hand, Durant must have been wondering—along with most everyone else—if the Thunder were simply cursed; there was just so much inexplicable bad luck. They made the worst trade in NBA history, then had injuries, then had injuries again, and then Klay Thompson found a power-up, lit the ball on fire, and never missed a shot again. Maybe it just was never and could never work out in Oklahoma. But on the other hand, had he won in OKC—and they were so close!—it would have been everything that Cleveland saw with LeBron this year, only KD would be free of the stink of The Decision. He would be the league’s most loyal superstar. He would have been the one that was able to bring his small market (adopted) home a championship without leaving. His legacy as a member of the greatest could-have-been team in his era would have been finished. The Thunder would have erected a statue of Durant outside The Peake before the confetti was even cleaned, Oklahomans would have elected Durant governor, and Warner Bros. would have ordered a rewrite of Space Jam 2. Durant would have been the most beloved athlete in America by a healthy margin. But on the other hand, winning one in OKC would be nice, sure, but he knows he will win in Golden State. After all, they’re light years ahead of everyone else, and at the end of the day, however subjective it might be, we use banners as yardsticks for greatness in basketball. Before winning a third ring, most considered LeBron a top-5 player all-time, maybe. A week later, he’s slotted in as MJ’s heir, even though nothing changed, really. LeBron did nothing in that series that he hadn’t already done before. Had he stayed, Durant may have never had anything to show for his efforts, and he would never be considered one of the all-timers. He needs a title, and that’s what going to Golden State offers him. Offers is the wrong word, actually. That’s what going to Golden State guarantees him. He will win a title there, likely more. And then we can start talking legacy. But on the other hand, won’t any Warriors championships have a big, fat asterisk next to them? The Warriors were already a championship team without Durant. They were the best team in (regular season) history. Some might say, “A ring is a ring,” and I’m sure that’s Durant’s thinking, but there’s a fundamental difference between winning a championship and joining a championship team. There’s less individual will required. In the end, it’ll make Durant’s legacy even more complicated. How do you measure his greatness when you never know if he could have done it on his own? We’ll have to say that he couldn’t do it solo, and that’s why he left OKC. We’ll have no choice but to say he’s weak. But on the other hand, what a completely ludicrous standard to hold a 27-year-old to! Let me ask you this: if you had get from Los Angeles to New York, would you rather take the direct flight from LAX-JFK, or drive to Long Beach, stop in O’Hare, and then wait on the tarmac for an hour before finally leaving for Newark? Durant chose the direct flight, because of course he did. Can you blame him? And that’s where we’re left with this latest move: complete confusion. Maybe it’ll make sense one day. But right now, all we know is which team is going to be hoisting the trophy next June. I understand Durant began his career in Seattle. But he never emerged as a star until the team moved.